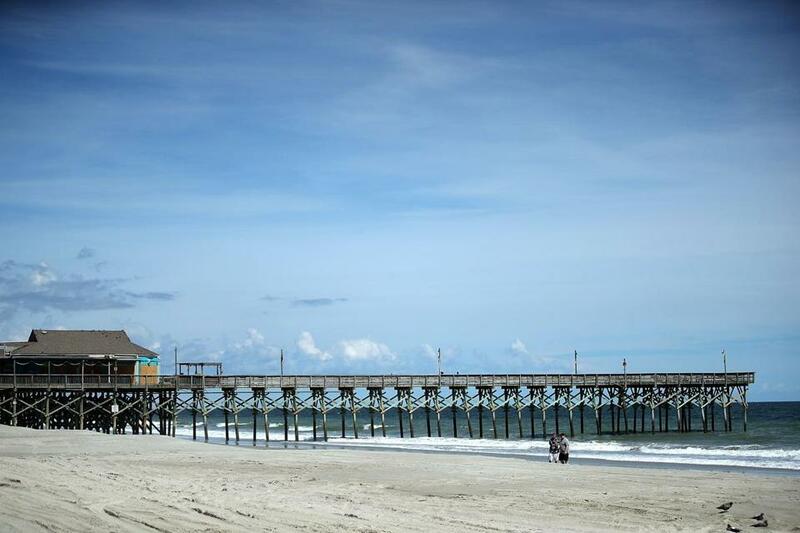 The 2nd Ave. Pier in Myrtle Beach, S.C., was closed ahead of the approaching Hurricane Florence. Forecasters are expecting Hurricane Florence to wallop the southeastern US coastline, and more than 1 million people are under evacuation orders. Officials are warning that the hurricane could become a multiday event as it slows down before making landfall. Here’s a selection of webcams livestreaming the conditions along beaches and just offshore, as well as a live radar. A webcam overlooking a beach in Kitty Hawk, N.C., is operated by a vacation rental company. A webcam surveying the ocean from a former Coast Guard Tower 34 miles off the coast of North Carolina. See a livestream of the surf conditions and pier at Emerald Isle in North Carolina. As of Wednesday evening, the surf was already picking up. Here’s a livestream from Bogue Inlet, also on Emerald Isle. See the progress of Hurricane Florence on a radar map from WAVY in Norfolk, Virginia.